United led temporarily before losing six goals, with Johnny Russell's late strike offering scant consolation. "It hurts, the scoreline hurts," said McNamara of his first defeat as Tangerines boss. "We lost some poor goals. We've got a big game on Tuesday against Motherwell. We need to defend better as a team. They have to stand up and be counted." Jon Daly had a penalty kept out when United trailed 2-1 and the visitors forced Celtic keeper Fraser Forster into other saves throughout the match. But it was defensive frailty, rather than profligacy, which proved to be their undoing. 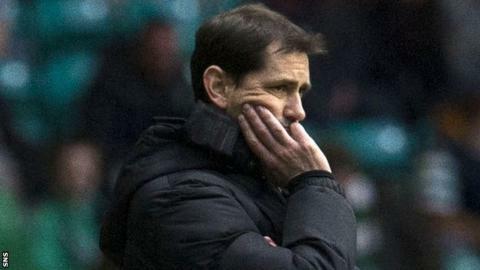 "It's easier to accept if they're carving you open with good play but it was set pieces and one was [Anthony] Stokes coming off and we let him have a free shot," explained McNamara. "There's wee things I'm not very happy about. We need to do it properly. "We got the goal up and, at our most vulnerable, we conceded from a corner, which you can't do at any level. "I think some of them lacked a bit of belief later on and just wanted it over. "We're capable of scoring. We've tested the goalkeeper, we've missed a penalty to go 2-2. There's a thin line sometimes."